54) be cut off. 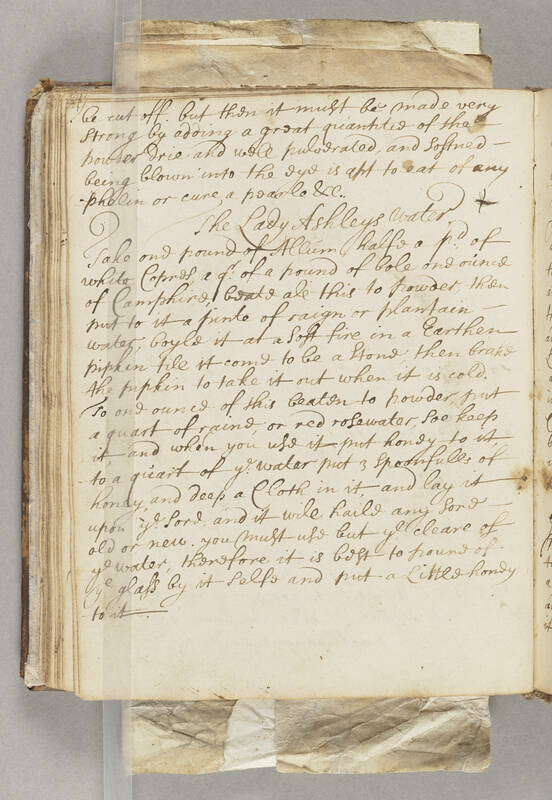 but then it must be made very strong by adding a great quantitie of the powder drie and well pulverated, and Softned being blown into the eye is apt to eat of any phelin or cure a pearle &c. The Lady Ashleys water. Take one pound of Allum, halfe a pd of white Copres, a qr of a pound of bole one ounce of Camphire, beate all this to powder, then put to it a pinte of raign or plantain water, boyle it at a Soft fire in a Earthen pipkin till it come to be a Stone, then brake the pipkin to take it out when it is cold. To one ounce of this beaten to powder, put a quart of raine, or red rosewater, Soe keep it, and when you use it put honey to it, to a quart of ye water put 3 Spoonfulls of honey, and deep a Cloth in it, and lay it upon ye Sore, and it will haile any Sore old or new. you must use but ye cleare of ye water, therefore it is best to poure of ye glass by it selfe and put a Little honey to it.